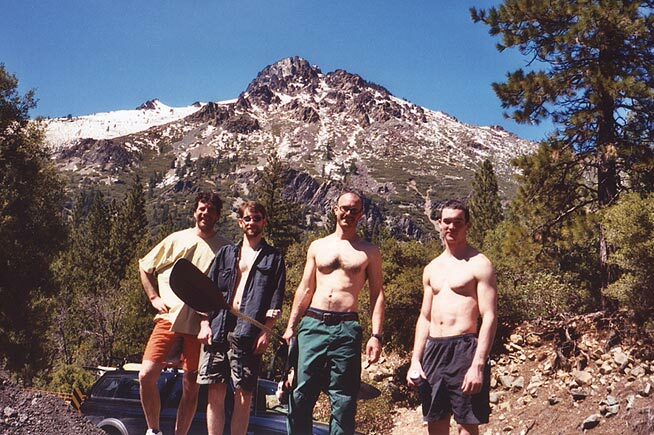 In April 2003 we took our annual California Spring Break trip, which ended up spanning five major river basins: The American, The Yuba, The Sacramento, The Trinity, and the Salmon. We paddled a wide variety of rivers and creeks, met some great folks, and had a great time. At the end of the trip we had: Two broken boats, one broken paddle, and two swims out of burly hydraulics. This time around I was accompanied by: Pete Giordano (Portland), Dan 'The Man' Coyle (Corvallis), Josh Knapp and Gabe Flock (Eugene). The Loves Falls section of the NF Yuba doesn't get run that often, mostly because nobody knows much about it. 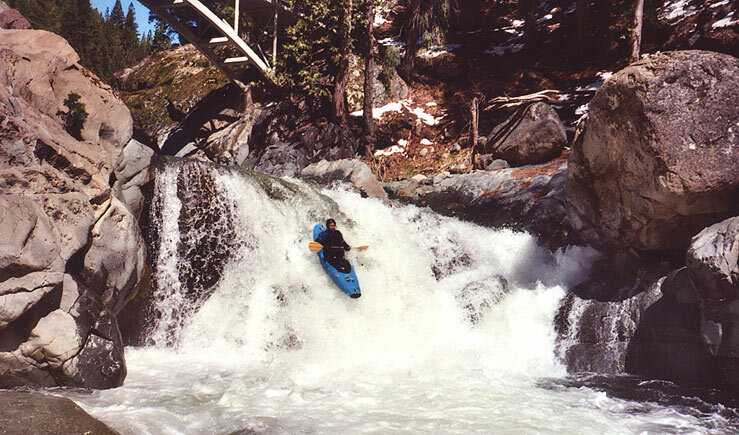 This is unfortunate, because this is a classic California Sierras run, with huge, clean drops and stomping hydraulics nestled in a spectacular High Sierra granite gorge. The Stanley/Holbeck guide gives only the vaguest information about this run, saying (quote): "The gifted Kern Brothers ran it and though I haven't talked to them I decipher from gossip they found it very challenging, high quality, and difficult." Ok, so up to that point the description sounds pretty good, but then the guidebook goes on to say: "This run is not for most people. It is extremely steep, narrow, clogged with rock, wood, and blindness. If it is for you, you know what to do and no amount of chatter from anyone is going to change anything. Be careful and live!" Heck, even the most aggressive class V type might start to sweat a little after reading those words, especially since the author did the first descent of Bald Rock Canyon and many other extremely hard runs that are still on the bleeding edge of gnar and to this day inspire fear and loosen the bowels of most boaters..
Of course, Dan Coyle is not your average class five boater; in fact, Dan often ends up paddling solo because he runs stuff that is so hard most people can't handle it. That said, a run like Loves Falls is the kind of river he lives for. Therefore, it came as no surprise on the morning of Day Three when Dan announced he wouldn't be joining us. 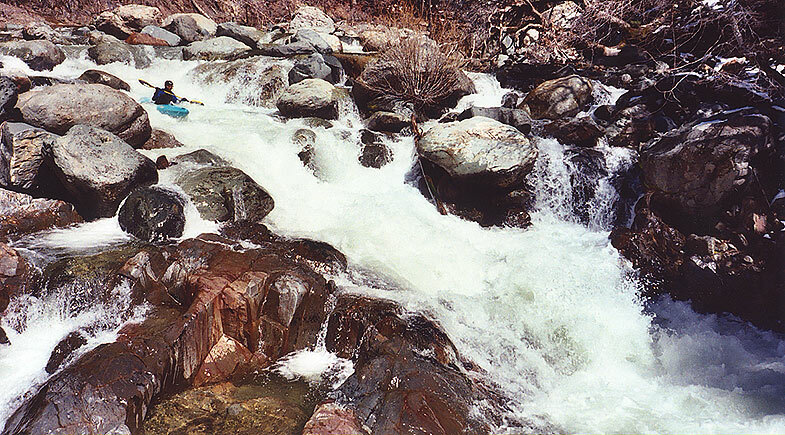 We had decided to paddle the Sierra City section of the NF Yuba, a IV-V run described as 'classic' in the guidebook, but Dan had other plans. 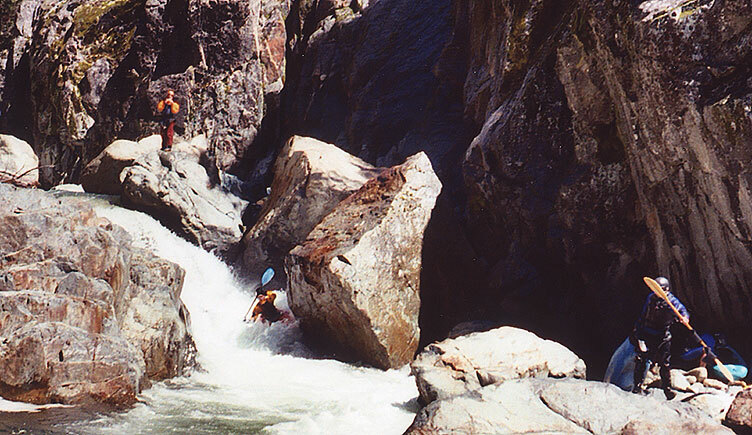 So, as we were putting in on the lower section, Dan headed upstream to take on the Loves Falls section, by himself. The rest of us paddled the Sierra City section, and had a great day. Josh was going off as usual and ran everything, including burly crux drop in Ladies Canyon, which drops into the 'murderous hole' described in the guidebook. (photos and full trip report to follow). But we were all a little worried. All day long, in the back of our minds, we were wondering about Dan, hoping he was ok, hoping he was going to show up at the take-out at the end of the day.. Hoping that Loves Falls wasn't too hard even for 'Dan the Man'. Once we finished up on the Sierra City section, we loaded the boats and headed upstream. It was starting to get dusky, and we were hoping that Dan hadn't decided to continue downstream onto the Sierra City run, in which case we might miss him in the dark. We reached the turn-off that leads down to the bridge and as we crested the hill we were relieved to see Dan, walking up the road. He piled into the truck with us, looking very, very tired. "Sooo. How was it?" Gabe asked. "It was hard." Dan said. "I broke my boat, my paddle, and took the worst swim of my life." "Did you hike out?" Gabe asked. "No, I finished the run. It is definitely one of the best rivers I've paddled, I was just so tired from scouting everything that when I got stuck in the hole I had no energy left to fight it; I'll do it again tomorrow if anyone wants to go..."
Now who could resist a description like that?!? Certainly not this group of yahoos! 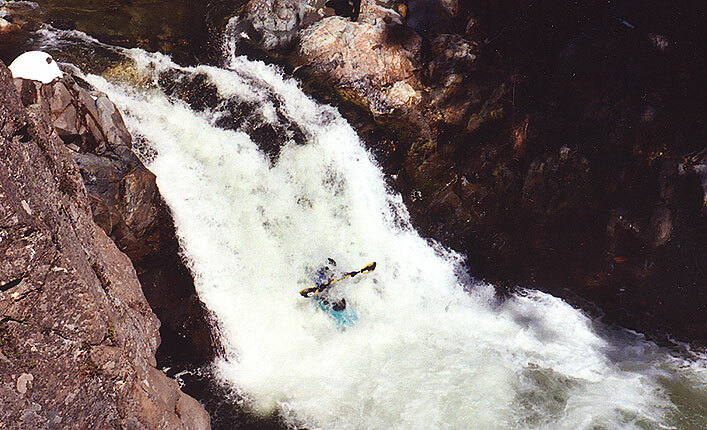 Pete Giordano runs a falls just below the put-in for Loves Falls. The section upstream has a portage, (the huge boulder-jumble visible at the top of the photo) so the best put-in is just above this falls on river-left. (see the end of the report for details). 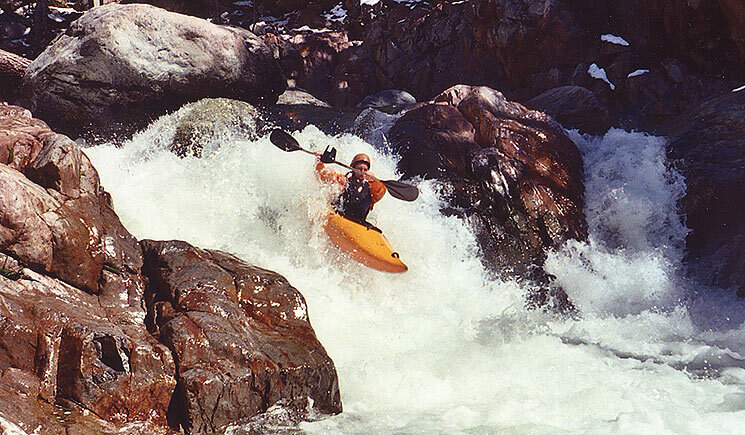 Pete Giordano melts down at the third falls, just downstream of the second falls pictured above. This one caused a couple of tailstands but was pretty forgiving overall. Pete again, running a boulder garden just downstream. All of the rapids were of the pool-and-drop variety, each with a significant horizon line. Josh Knapp, going off as usual.. here Josh probes a dangerous and difficult waterfall while Dan watches from above. Pete charges down one of many sweet drops on the lower section..
Dan explodes through a tricky drop just downstream..
Gabe flock lines up on a large hydraulic while Josh and Pete wait in the pool above.. FLOWS and ACCESS: The take-out for this run is the put-in for the Sierra City run described in the Stanley/Holbeck guidebook. We had about 200 cfs; more would have been ok, but not too much more! 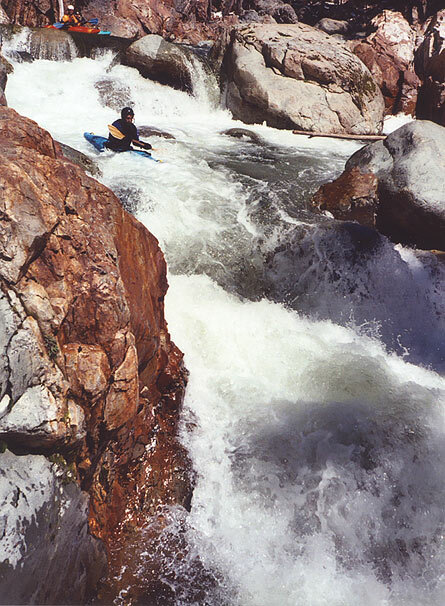 There was about 1100 cfs in the North Yuba at Goodyears when the photos on this report were taken. ACCESS: Is astonishingly easy for a Northern Sierras run of this calibre. Drive upstream a little over a mile until the road levels off slightly and you can see a deep gorge on the right. Get out here and locate the Pacific Crest Trail Bridge. There is a large gravel pull-off to park in just downstream of the bridge. About 50 feet into the woodline from this parking spot is the Pacific Crest Trail; follow this downhill to the bridge, which allows a great view of the first falls upstream and an even better view of the next falls just down from that. Hike your boats across the bridge to the river-left side, follow the trail up a couple of switchbacks, then hike about 100 yards upstream to a narrow gully that leads to the river just upstream of the twisting falls which Pete is pictured running at the beginning of the report. It is possible to drag your own boat down here but you will probably want to send someone down first then rope the boats down. 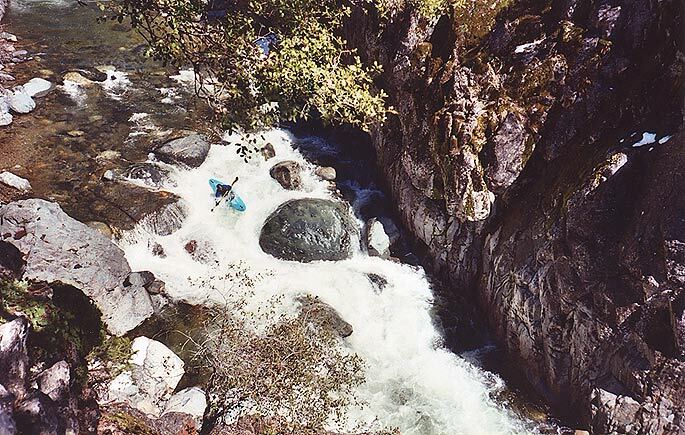 There is an extremely steep bouldery section upstream of the 'Classic' Loves Falls run. Dan ran the whole thing when he was solo and doesn't recommend it; there is a portage and the boulder gardens up there are a little trashy in places; that's the section he broke his boat on. Most of these drops are visible if you drive upstream. Many of you may be wondering where this river is located. 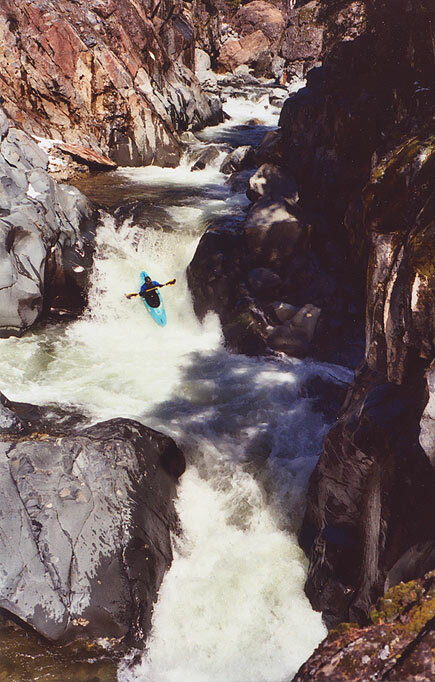 The North Fork of the Yuba flows through the wild and rugged Tahoe National Forest. It is about a 9 hour drive from Portland, depending on how good your radar detector is. We drove down I5 and then turned east on Highway 20, (where the 'I5' symbol is on the map) and headed east up to the river from there..